← Yamaha Outboard Motors are the Best Marine Motor! I have a 2013 Gheenoe NMZ. I use this boat to fish the back waters of The Intra Coastal in New Smyrna/Edgewater Florida. I run a 9.9 Yamaha 4 stroke with a manual jack plate to give it a couple extra inches of draft in those Skinny Florida back waters. I had to put a hydra foil on the engine to help the boat plane better. I can take off in shallow water better with that hydra foil fin also. The hydra foil prevents the rear of the boat from sinking way down in the water. The engine I have on it pushes the boat with me and all my gear (about 500 lbs including the boat) at around 22 MPH with that jack plate on the boat for the motor. I can run on less then a foot of water at full speed. With the motor up out of the water I can float along in just ankle deep water. About 3″- 4″ of water will float this boat with all the fishing gear and coolers in it. That’s impressive. This boat is light weight also, so if you forget about the outgoing tide the boat is fairly easily slid across the sand back into the water. I know that from personal experience! 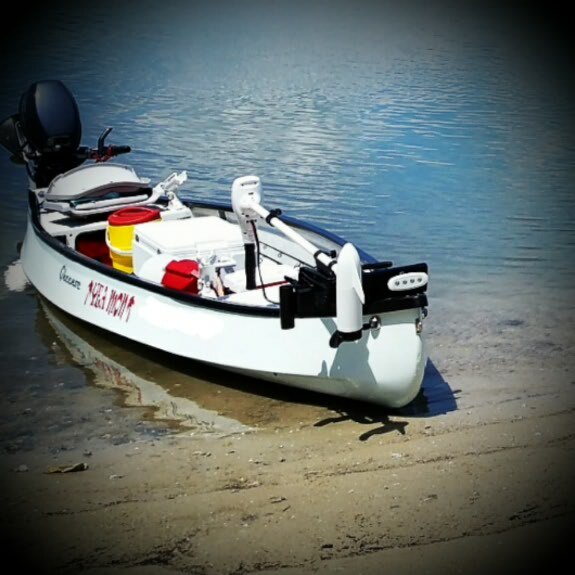 You don’t have to wait for the tide to come back in, 6 hours later… If you are looking for a shallow water light weight boat the 15′ 4″ Gheeno NMZ is the way to go. Remember to stay well hydrated and make sure you drink water in between the brewskis. Thanks for reading. Posted on June 13, 2015, in My Boat and tagged fishing, Gheenoe, small boat. Bookmark the permalink. 3 Comments.